Earlier this year, I had the honor of being a bridesmaid for my friend Kaitlyn's wedding. 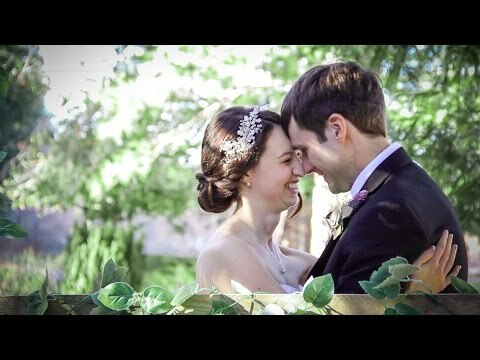 However, because she was a good friend, there was no way I was going to let anyone else film her wedding video! It took some careful planning, but me and my team were able to pull it off and put together a beautiful film. Here's how we did it! First, I needed to assemble a team. I got together with my second shooter Ahnas, and my brother Ethan to map out our plan. On the wedding day, I got to the San Moritz Lodge and shot the pretty details and venue shots. Afterwards, I quickly did my own hair and makeup, and got dressed. I then stepped back and filmed the preparations. Meanwhile, Ahnas documented the groom and his groomsmen. The trickiest part of the day would be the ceremony, so Ethan joined the crew to man the camera at the top of the aisle while Ahnas was down near the bottom. After I walked down the aisle as a bridesmaid, I walked past my "spot" and went to a camera that was waiting on the side so I could capture my favorite part of the ceremony: the moment the groom sees his beautiful bride for the first time in her gorgeous dress. After Kaitlyn's dad gave her away, I placed that camera back on its tripod, and stepped back into my spot. During the ceremony, Kaitlyn and Michael shared their first communion together as husband and wife, and I snuck quietly around the back to capture the special moment. Next was the reception, which was a whole lot easier than the ceremony. My two assistants captured all the main events, and I picked up my camera occasionally to get some of the pretty sweeping shots to go into the highlight video. I'd like to thank Kaitlyn and Michael for trusting me with their wedding film, Ahnas and Ethan for helping me film, and my husband and the rest of my family for keeping everything going smoothly and kid wrangling during the day. Also thanks to my mom, Trish, for being a great DJ to work with, and Tony Gillian at Expert Photo for photographing the day, and for the awesome Behind the scenes photos. If you haven't gotten to watch Kaitlyn and Michael's film, be sure to check it out below!